Denby Dale is steeped in history, and is first recorded in the history books as Denby Dyke, where the turnpike road crossed the River Dearne. Denby Dale is famous for its giant pies which have usually been made to celebrate major events in the nation’s history. The first Denby Dale Pie was made in 1788 and was said to celebrate the recovery of King George lll from a bout of ‘madness’. The second in 1815 celebrated the end of the war with France and the defeat of Napolean l; the third on August 19th 1846 celebrated the end of the Corn Laws. The next two pies occured in the same year, 1887. On August 27th a pie was baked to celebrate the Jubilee of Queen Victoria. Unfortunatley the pie, having stood for some days in hot weather, was quite inedible and had to be buried in a pit of quicklime. A second pie, known as the ‘ressurection pie’ was baked on 3rd September. The next pie on 1st August 1896 celebrated the 50th anniversary of the Repeal of the Corn Laws in 1928 on 26th August a pie was baked as a belated victory pie and to raise money for the Huddersfield Royal Infirmary. On 5th September 1964 the eighth pie celebrated four Royal births and helped finance a new village hall (The Pie Hall); and on 3rd September 1988 a further pie celebrated the bi-centenary of the first. The last pie formed part of the Millenium celebrations in 2000. The Pie Hall holds a large collection of Pie memorabilia and two of the pie dishes remain in the village. The Denby Dale pies are not your normal run-of-the-mill pies – these are monster meat, and sometimes potato, pies that have been registered in the Guinness Book of Records in past years! 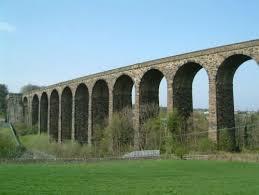 The Railway Viaduct is one of the main landmarks of the village – as it strides across the Dearne Valley carrying the Penistone Railway Line across it. The viaduct started life in 1846 as a wooden construction, opening in 1850 as part of the newly-constructed Huddersfield to Sheffield railway line – but not before it was badly damaged in a storm and partially rebuilt. It was an obvious fire hazard, 400 yards long and 112ft high and wobbling as every train travelled over it. Each day, local railway workers had to refill fire buckets with water along its whole length – although by the end of the day, most of the water had slopped out of the buckets due to the vibrations of the trains. Discussions began in 1867 to replace it with a stone built one, but it was not until 1877 that the local firm Naylors won the contract. Just over two years later it was complete, with an official opening in 1880, although it took another 4 years before the wooden structure was finally dismantled. All of the above books are available from J R Nicholls Bookseller & Publisher, Denby Dale. For mail-order contact www.jrnicholls.co.uk or Tel: 01484 866413. The current Parish Council was formed, along with Kirklees Metropolitan Council, in 1974. Previous to that, our area had been administered since 1938 by Denby Dale Urban District Council. Thanks to funding from the East Peak Innovation Partnership (see www.epip.org.uk) the archives of all these bodies are now accessible on the above web-site, along with archives from two former major textile companies, Joseph Kenyon & Sons Ltd of Denby Dale and G.H. Norton & Sons Ltd of Scissett. The web-site also offers access to YouTube clips describing life in a Skelmanthorpe Weaver’s Cottage c1900 and extracts from the local history books written by Leslie Robinson and published by the Parish Council.